Brown Leather Pipe Pouch with Lighter and Tool Pocket. Handcrafted in the U.S.A. 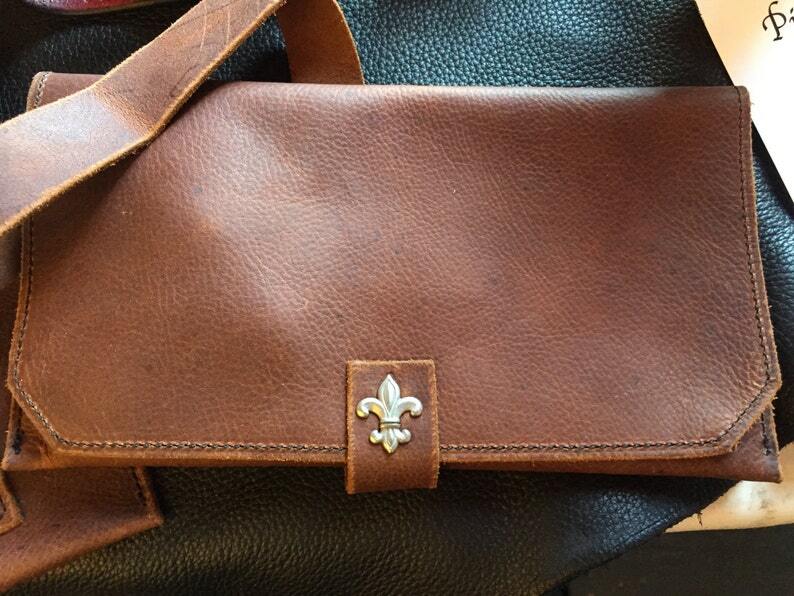 Here is a brown leather pipe pouch. The main pocket is perfect for a pipe. There is a pocket made for a zippo with a magnetic snap strap to keep it securely in place, and the back of the snap is lined with pigskin as to not scratch your lighter. The other pocket will house your variety of tampers. The brown leather used is a sturdy, pliable, and flexible oil tanned leather that has a unique rustic character in every bag. Handmade Leather Pipe Cleaner Case. Handcrafted in the U.S.A.
PipeTube leather pipe case with matching pipe stand Handmade in the U.S.A.
Sunset Oil Tanned Leather card wallet - holds 6. Handcrafted in the U.S.A.
Skull CigarTube leather Cigar Case Spanish Cedar Lined Handmade in the U.S.A. The CigarTube leather Cigar Case Spanish Cedar Lined Handmade in the U.S.A.
SALE! - Ready to ship Tentacle Skull CigarTube leather Cigar Case Spanish Cedar Lined Handmade in the U.S.A. I had received this the other day. I absolutely love it. The craftsmanship is spectacular. Hammered Copper Finish Leather refillable Journal Cover Hand Tooled. It’s a little more blue than purple but still love it. High quality work!! Thanks! I accept major credit cards via Etsy, or paypal. Payments for custom work, if custom item with options is listed, are due at the time of request and work will be rendered within the next 1-6 weeks after order unless otherwise specified in the listing. All items are made by hand and time to hand make an item depends on the item and the amount of current orders I have at the time. This is to assure that I am not left with a personalized piece that will be hard to sell if not purchased by the requester. If you purchase a reserved item that was not ment for you I will refund your money minus transaction fees and cancel the transaction. I ship via USPS, priority mail in the US, First class to the UK and Canada. I will send confirmation once the item has shipped. For custom items with specified options, please specify the customization and available options (color, initials, custom logo/design) in the note to seller when purchasing. The available options will be listed in the listing to choose from. Custom Leather Cigar Case Without Cutter Pouch and Spanish Cedar Lined. Handmade in the U.S.A.
Perdomo Leather Cigar Case Spanish Cedar Lined. Handmade in the U.S.A.
Mahi Mahi Leather Cigar Case Spanish Cedar Lined. Handmade in the U.S.A.